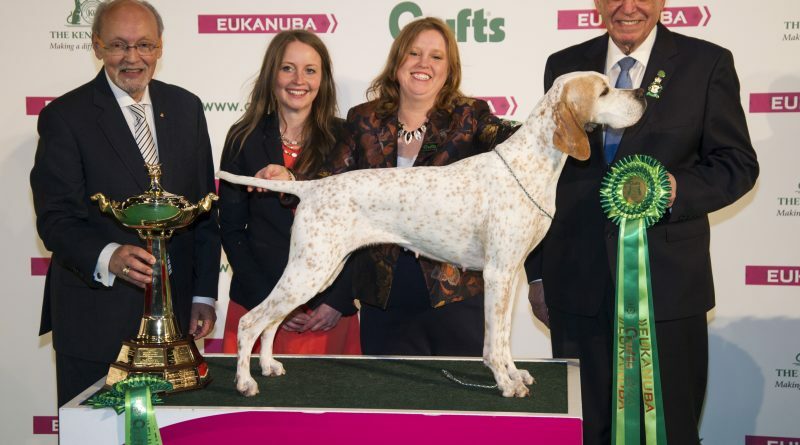 Chilli, a Pointer from Poulton-Le-Fylde in Lancashire, won the Gundog Group title at Crufts 2018 on Sunday (11th March), qualifying them for a place in the Best in Show final that evening. She had earlier won the veteran class in her breed. Chilli (whose official Kennel Club name is Show Champion Kanix Chilli), aged seven and a half, returned to the Genting Arena at the NEC in Birmingham for a place in the final at the world’s greatest dog show, Crufts, with her owner, Heather Blackburn-Bennett. In the final, Chilli finished as Reserve Best in Show (second overall) and was handled by Heather’s mother, Joanne, whose own mother Ellen was cheering them on in the stands. Appropriately, it was Mother’s Day and all three women, who have each exhibited champion show dogs at Crufts over the years, were able to celebrate in style. People around Britain and the world were watching to see which dog was crowned the ultimate winner, as the final was shown live on Channel 4 and streamed live on the official Crufts YouTube Channel – www.youtube.com/crufts. Best in Show was awarded to a Whippet, Champion Collooney Tartan Tease, owned by David and Yvette Short of Edinburgh. Almost 21,000 dogs competed over the four days for one of just seven places in the Crufts final and a chance to win the most celebrated title in the world of dogs. Caroline Kisko, Kennel Club Secretary, said: “We were delighted to see Chilli chosen as the Gundog Group winner and were even more thrilled when they ended up as Reserve Best in Show. Chilli and Joanne should be very proud of reaching the prestigious Best in Show final – it’s an incredible achievement and one that not many get to experience in their lifetime.